Having already shown you all my yarn stash some time ago, I figured it was time to do the same for my fabric stash. 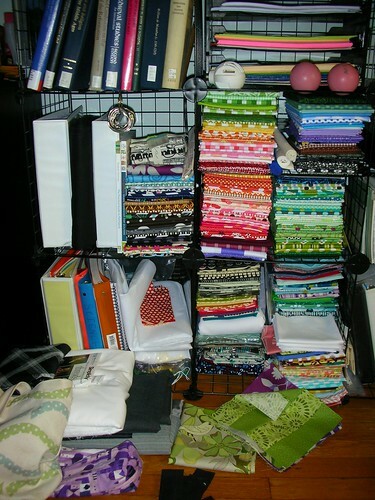 I always love seeing the way other people organize their fabric, and how they store it: hopefully some of you feel the same way. It’s a disaster area right now. To the left there are two cubes that are only about half fabric: one has my neutrals-and-or-miscellaneous pile and a bunch of black fabric; the one below it has interfacing and bags of scraps. The floor is usually … well, no, it’s not usually any neater than that. 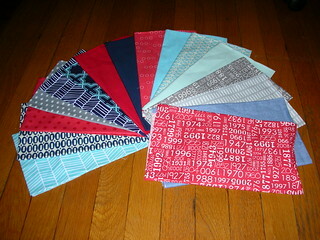 I’m trying to figure out what to do with the leftover blocks from the Mixtape quilt (probably pillows?) and I have the fabric for two skirts that I haven’t started just yet. And, well. That’s almost all of my fabric. 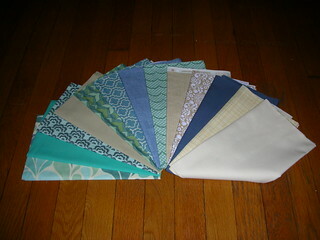 There are also the blue and brown fat quarters I pulled for the Dresden quilt, and the coffee-themed fat quarters that will become a shoulder bag, and the bits I’ve cut for the Kitchen Window quilt. *ahem* I think I just need a little more time, and I’d be able to tame it a bit. I fold all of it the same way, following this method, on In Color Order for uniformity’s sake. For cuts a half-yard or larger, I make one less fold, leaving me with a long rectangle of fabric (that fills up the back of my deep shelves) instead of a shorter, fatter square. 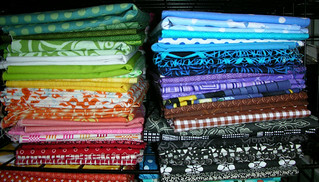 Fat quarters are shorter squares, and I shelve them two-deep. 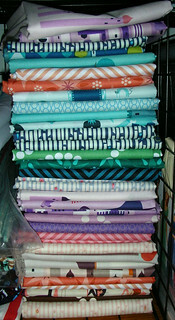 I break one other “rule” in my neutrals stack: you see that fat quarter block of Summerville? 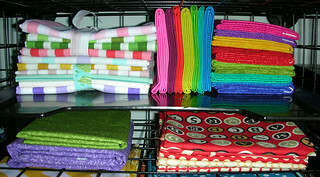 Well, I shelve my fat quarters separately, because of the way I fold things. Those Summerville blocks should be in one of these stacks! This one is my back row of fat quarters: solids and single-color prints and stripes — since taking this picture, I’ve integrated the stripes into my color-sorted piles and used the Circa 1934 on the bottom right of this photograph. Finally, there’s the miscellaneous stacks on the bottom. 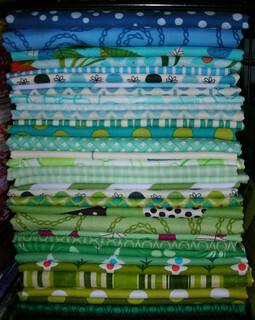 They hold larger cuts of fabric, fat quarter collections, or complete lines. The very top is Curious Nature, by Parson Brown. The next one down is Circa 1934 in blacks. 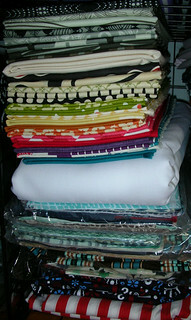 The next after that is a rainbow bundle from FabricWorm, which sits on an enormous cut of white Kona cotton. 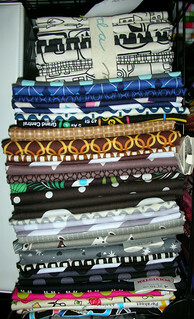 Below that are two fat quarter bundles from Pink Castle Fabrics. 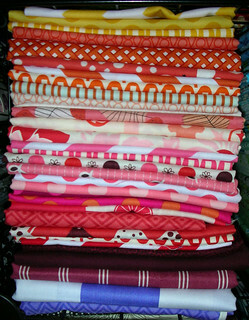 I have projects in mind for much of this — certainly for most of the fat quarter bundles. But I do pick things up from time to time not because I know exactly what it’s going to be, but because they’re pretty. I love all of your fabric! You have some really great greens, of which I’m very jealous! I can never seem to find greens that I like. Previous Previous post: Finished Filmstrip Quilt!